This beautiful wall mounted jewelry armoire is a wonderful alternative to the more traditional, yet crowded, jewelry box. It allows for you to hang your favourite necklaces, bracelets, earrings, rings and other precious items in a safe, secure and spacious environment. What’s more, the armoire features a large mirror door together with a lock and key for extra security and privacy. 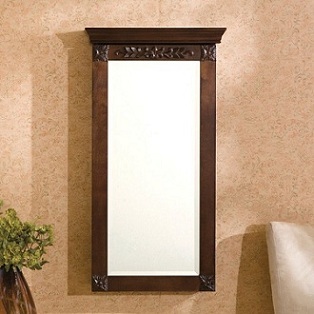 The bevelled mirror is ideal for checking how your jewelry looks on you before heading out. The Franklin wall mounted jewelry armoire is made from a variety of hardwoods and is decorated with square floral appliqués on each corner. Inside, black felt offers soft protection for your rings and necklaces whilst an assortment of hooks, racks, and trays provide a multitude of options for different types of jewelry. When first setting eyes on the wall mounted armoire, it is not immediately clear what its purpose is. This is ideal if you want it to be fade into the background in relation to its true nature, so to speak. You can buy it from here: Wall Mounted Jewelry Armoire.